Are you looking for eCommerce platforms to create your online shop? It is indeed a fact, choosing eCommerce platforms it might be a fairly confusing task – especially if you aren’t from a technical or eCommerce background. In this article, we explore the top best eCommerce platforms suitable for small businesses to start an online business. The eCommerce market is growing at a rapid pace. And with the new technology innovation, new opportunities are opening up for small business entrepreneurs. Nowadays, having a small online shop for your own products is possible with really a small capital investment. After using and reviewing lots of online store builders in the past few years, we put a list of the top 10 eCommerce platforms and shopping cart software that are the best fit for any needs. With hundreds of choices out there, people aiming to build eCommerce stores often find it difficult to pick and choose a platform that can best serve their requirements. So before starting your online shop take a look at the recommended list of eCommerce platforms for small businesses. Shopify is one of the first names that comes to mind when one thinks of an online commerce platform. With 90,000 sites using Shopify, it is one of the most popular eCommerce platforms in India. 24/7 customer support – Can be reached by phone, online live chat or email. 3dcart is the new age eCommerce web store solution that provides for both small and large scale businesses everything that you need for online selling. 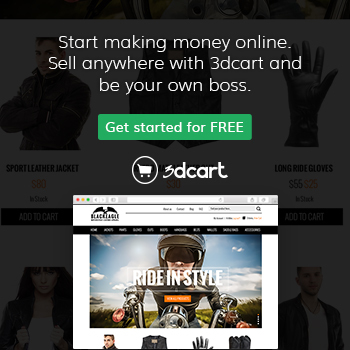 If you are looking for an affordable feature-rich self-hosted online selling, 3dcart can be the ideal solution. Wix is an easy drag and drops website builder for people who do not enjoy coding. You can access a large number of plugins and extensions. WooCommerce is a free eCommerce plugin built for WordPress. The plugin is open sourced and basic functionalities of starting an online store are offered free of cost. However, if you need more advanced features, there are plenty of add-ons which you need to buy. osCommerce is a fairly popular platform as well. In addition, it has a huge support base and a very active forum. However, some users find that updates to the platform have not kept up with the times. Drupal is the second most-used open source website content management system after WordPress. Its seamless integration with Drupal makes creating a blog or forum much more convenient than most other eCommerce content management systems. Opencart is another open source CMS for eCommerce. It has one of the easiest to use backends. However, its support systems are not as comprehensive as compared to the other platforms listed. Bigcommerce is another popular platform, with 17% of the top 100,000 sites using hosted eCommerce solutions; and 70,000 plus sites overall, being built on Bigcommerce. Mumbai-based Zepo supports more than 1200 eCommerce stores at the moment and has also raised an undisclosed amount of funding in December 2014 to drive its expansion plans. Hosted by Rackspace servers – so you can expect a better speed as compared to most platforms. Broadly, there are two different types of options available to start an online store. Either you can use managed hosted eCommerce platforms or open source content management system. A hosted eCommerce platform is hosted on a server and you will not have to access it. On the other hand, CMS-based websites are self-hosted on server space and you will have to purchase it. However, Select the one which suits best for you depending on your specific needs as well as your own technical expertise.